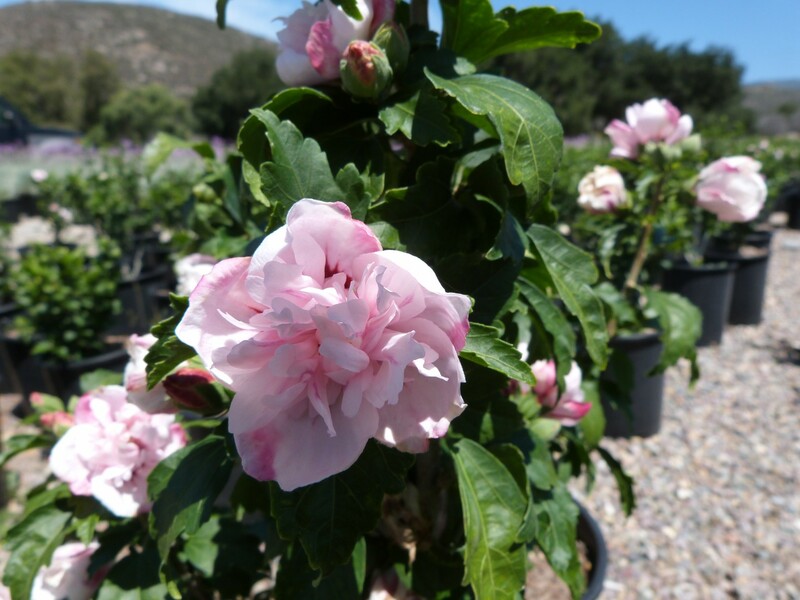 Rose of Sharon is known as a showy blooming shrub with large hibiscus-like flowers in summer. While there are many varieties to choose from, double flowering varieties such as ‘Double Pink’ and ‘Double Purple’ produce unique ruffled flowers. Rose of Sharon brings a tropical look to more temperate gardens. Foliage is a light glossy green with serrated edges and drop during winter. Plants grow into a vase shape and grow to an average of 10-feet tall if left unpruned; however they may grow taller in warmer climates. This allows you to use them like a small ornamental tree. Plants can be pruned to maintain a smaller shrub-like size. Plant them as a blooming specimen or accent in a full-sun location; they can also be used as an informal hedge or screen. Plants can tolerate some light afternoon shade but bloom heavier in direct sun. Plants need well-draining soil and prefer slightly acidic soils; plants can succumb to certain root rot or fungal leaf spot diseases in wet soils or if over-watered. Plants may become chlorotic in very alkaline soils with a high pH. Flowers are irresistible to hummingbirds, butterflies and bees. Note that Rose of Sharon can reseed and is considered invasive in some areas.